Councillors might have put Cornwall’s privatisation on probation. But the council had already begun acting as a joint venture partner with BT. They voted unanimously Tuesday to suspend a proposal to put up to £800m of public services into a company in which BT would own a majority stake. BT planned to transform it into a hub from which it would manage the privatisation of other council services around the country, and to operate a telehealth business. Councillors withheld their approval and said they wanted to scrutinise the deal properly before approving it. But a “confidential” BT brochure mailed to councillors by Cornwall’s own executive last Friday said Cornwall was already working with BT on bids for business from other public authorities. “We are already in three competitive bid situations for Telehealth/care with Australia Telehealth, Northumbria Telehealth and Hampshire Telecare; where we have named Cornwall as our partner,” it said. BT had been one of two companies competing to acquire Cornish public services. The other, Computer Sciences Corporation, pulled out last Wednesday – just two days before BT’s admission that it had already been operating as Cornwall’s partner. 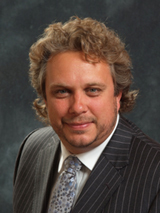 Councillor Steve Double, who had led the process for the Cabinet till his resignation last week, told Cornwall Council chamber Tuesday that competition law had forbidden councillors from having proper scrutiny of the procurement. This had apparently suited Kevin Lavery, Cornwall Council CEO. He had written, in his books on local government privatisation, that councillors should be engineered out of the council executive’s decision making process. That’s what Councillor Jan Powell told the chamber on Tuesday. Lavery’s attempts at local government privatisation had last run into trouble when he was CEO of Newcastle City Council in 2001. He tried to form what was then a pioneering strategic partnership, with BT. Councillors opposed him. He resigned and they tore up BT’s bid. 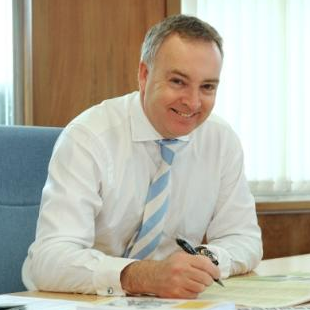 Lavery spent the the best part of the next decade doing outsourcing on the supply side, including a stint as head of local government at BT. Now a council worker again at Cornwall, he has had no specific meetings with BT. History is repeating itself all the same. 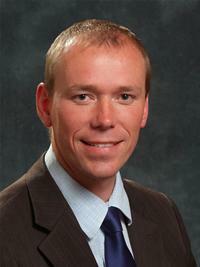 Yet things will be different from now on, Councillor Double told his colleagues before Tuesday’s vote. Councillors would be permitted to scrutinise the BT deal, where before the details had been withheld. While CSC and BT where in competition, procurement law forbade councillors from seeing the details of their bids, Double told Councillors. Now the council was simply giving the business to BT, they could see the details. Competition law didn’t apply when there was no competition. This is what it would take for public representatives to be permitted to see a bid to privatise their services before they were called upon to approve it. They would get all the facts to settle the public/private debate. Lavery would meanwhile be vindicated if BT’s plans passed muster. The first signs were however that the new transparency was not actually very enlightening. Not in the way it was supposed to be. Things started moving as soon as CSC dropped out last week. The council executive joined BT in wooing councillors ahead of Tuesday’s big vote. It pulled half of them into a meeting on Wednesday where four BT sales managers inundated them with promises and forecasts of greatness and prosperity. The only minuted, critical voice came from Unison the union. Then Friday, the council executive sequestered the services of Cornwall’s scrutiny office, which was meant to have taken an independent position on the outsource, to email a BT promotional pack to councillors.The scrutiny office also helped BT and Cornwall executives organise a promotional roadshow they did last Thursday. The email included a sales letter from Neil Rogers, president of Global Government for BT Global Services, and the “confidential” BT brochure. The brochure, styled as a “business plan”, set out an incredible vision for “BT Cornwall”. BT wanted to build a “Global Centre of Excellence” for telehealth and telecare in Cornwall. It would do this by assimilating assets acquired from Cornwall’s NHS Trusts. It would turn Cornwall into one node in a network of “business hubs and Centres of Excellence” it was building from its outsource deals across the public sector. Telehealth would become Cornwall’s specialism in the national and global economy. BT also wanted to acquire Cornwall’s procurement expertise. Yet its sales patter may have misled Cornwall councillors. 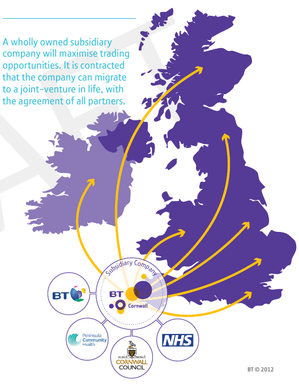 “BT is currently seeking a UK base for a Procurement Centre of Excellence, from which to support other UK public sector opportunities,” said the brochure. “Cornwall Council has an established procurement service that is rated as upper quartile by government audits,” it sa id. Thus it implied it might also put its national procurement hub in Cornwall as well, if it could only nab Cornwall’s procurement office. This is what councillors who supported the bid where saying. But BT is already building a “Procurement Centre of Excellence” out of an outsource it did with Lancashire County Council last year. Now called One Connect Limited, BT Lancashire’s backoffice aims, like Cornwall, to grow by assimilating the backoffices of other public authorities. BT’s “business plan” did not say how Cornwall would fit into its grand plan of global and regional “Centres of Excellence”. Might it have a mid-term plan to discard staff superfluous to the needs of a Centre’s specialism? If BT had already set up procurement elsewhere, might it want to acquire Cornwall’s procurement office only to strip its knowledge assets and kill it off? It might be too soon to call it a carve-up. As well as procurement, BT acquired various Lancashire services outside its alloted specialism. It picked up payroll, HR, and IT as well. Their superfluity might not become apparent for some years yet. Lancashire’s distinct district authorities are disparate from a corporate point of view. Not all of them went in on BT’s deal from the off. It might take BT the full term of its 10 year contract to acquire all their assets. Only then might it decide it doesn’t need human resources in Lancashire because it has an HR Centre of Excellence in, say, Derbyshire. For now, BT just needs to get the sale. It has 400 field sales agents leaning on chief executives in every public authority and NHS Trust in the UK. That’s what it told Cornwall councillors. And that a team of 27 people supported its sales force by firing concentrated campaigns at targeted authorities. In Cornwall this involved producing a brochure that looked like a business plan but left out the downside risks a sensible business manager would demand to see. The document is stuffed full of pastel-coloured promises. It has all the allure of the full-moon at a rave party, rendered as a tea-shop oil painting by a pony-tailed retiree who once took acid. Some councillors went goggle-eyed over it. “There’s very little information on the finance,” he said. The choice, however, was clear. It was the difference between the soothing noises made by BT’s army-sized sales and marketing department and the infamous Barnet Graph of Doom that claims to show how council budgets will be squeezed so severely by 2030 that they will need to flog off their services. The logic is peccable. BT’s marketing conjured a vision of Cornwall as a high-tech hub, networked not just across the Country but the Commonwealth. What it actually means is Cornwall will be the site of a medical call-centre. 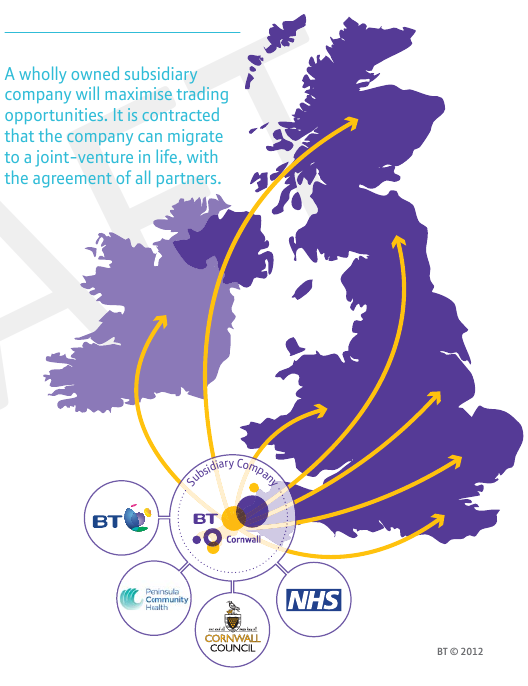 The attraction for BT is Cornwall’s unusually large population of dependants. Cornwall has fewer youngsters than the UK average, and more retirees, who’s incomes are less then average, and half of whom are dependant on care. This is a unique asset in the world of telehealth and telecare, where services are automated, commoditized and delivered over BT phone and network cables. The idea is that BT Cornwall becomes to the infirm what the City of London is to the rich: an international hub for the incapable and insensible. In years to come, it will employ a small army of joy-stick operators to direct drone mechanoids in the wiping of back-sides half way across the world. 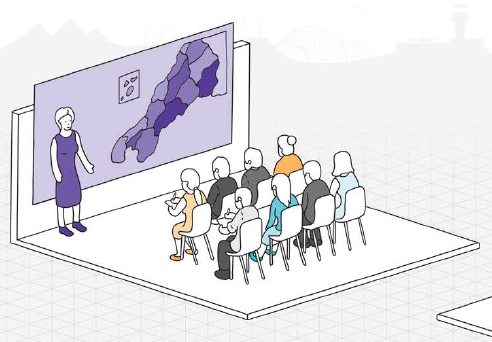 BT’s brochure proposed that Cornwall’s uniquely dependent population would be a valuable testbed for its telehealth technologies. 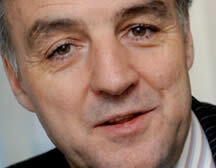 It proposed setting up an “R&D centre” in Cornwall to “develop new ways of delivering telehealth services”. This would employ five people primarily concerned with identifying innovative local firms who could be subsumed into BT Health, to give it a competitive edge with rival telehealth centres one presumes will be springing up in Bangladesh and Bolivia. They would report to BT’s real R&D centre in Martlesham, Suffolk, which employs not five but three and a half thousand people. 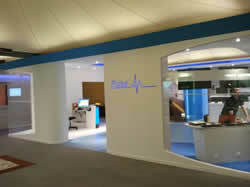 BT recently opened a Telehealth showroom there. 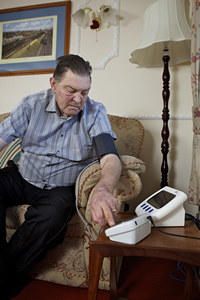 For BT, the race is on for Telehealth in the UK. NHS and Social Services are abuzz with the idea. Housing Associations have a head start. BT lost a bid to run telecare in Northern Ireland last year to a consortium led by Tunstall Health Care, the market leader, that operates a Centre of Incontinence or whatever you call it in Doncaster, South Yorkshire. It makes about £200m-a-year from 2.5m dependants in over 30 countries. It is a leader in the supply of alarm pendants for old people who take a fall. BT is counting on Cornwall to help it win tenders in a national government programme called 3millionlives, which aims to get 3m patients and dependants tended remotely across the NHS by 2018. The Department of Health reckons £70bn of the UK health budget goes on care of people with long term conditions, the target market for telehealth and telecare. That’s 15m people. 3millionlives will therefore turn the tap on a £23bn market, or whatever part of it can be administered remotely. Things start moving next month. Formal tenders start in “early 2013”. This may explain why BT gave Cornwall councillors an ultimatum this week: it would keep its offer on the table only until March. Fiona Ferguson, a member of the Cornwall Council Cabinet that backed the plan, passed the ultimatum on to councillors on Tuesday. She neglected to mention BT’s own spring deadline. But she did insist the council acted urgently. And she painted a desperate picture of the Cornish health system: “There are very serious challenges in adult social care and health,” she said. Tragically, at that very moment Carolyn Rule, Ferguson’s Cabinet colleague responsible for Health and Wellbeing, was lying, collapsed outside the council chamber door. Council leader Jim Currie interrupted proceedings to report that Rule had apparently fainted, but it was feared her situation might be much worse. They just didn’t know. Twenty minutes had passed since she left the chamber and collapsed outside its door. She was a very unhealthy colour and could still not sit up. It would be another five minutes before an ambulance arrived. Thankfully, Rule got a clean bill of health at the hospital. She had a check-up and was released later that day. But it was a worrying reminder of the sort of pressures felt by the health service in a rural county like Cornwall, where people were often far from help. The dilemma was stark. Councillor Julian German had spelt it out earlier. If Cornwall didn’t do a deal with BT, “there won’t be a world-wide Centre of Excellence for telehealth and telecare in Bodmin,” he said. Neither would there be a “procurement Centre of Excellence in Cornwall”, said German. Neither would BT deliver the promised cuts in those services it acquired from the council. Neither would it create 1,043 jobs that would be “committed in contract”. BT’s proposal had actually only guaranteed 350 new jobs. It had estimated that business might also grow quickly enough to create another 512 jobs. The other 181 jobs in BT’s 1,043 forecast were people it already employed at a “Truro retail facility”. BT had promised not to make them redundant for the life of the telehealth contract. It was like a number from a dodgy dossier. But you got the idea. The choice for Cornwall was whether or not to invest its resources in BT’s telehealth gambit. The original reason why Cornwall had started down the path that led it into talks with BT in the first place was now forgotten. Was it to pass the buck for a backoffice cull? Whatever it was, it was now second place. Cornwall’s priorities and all other alternatives would now be held up for comparison against against BT’s business plan, that pastel vision that had infected the collective mind of Cornwall’s Council Chamber on Tuesday like a mall shopper’s retail lobotomy. Councillors had stopped to recover their bearings. But BT had become the default setting. The Department of Health, incidentally, refuses to talk of its telehealth initiative in terms of market-size and supply-side opportunities. It likens telehealth to the introduction of the stethoscope: an inconspicuous tool that will slip into the complex arrangement of systems and people that make the National Health Service work. The department insists it will leave local trusts to incorporate the technology in the way they see fit. It has not insisted Trusts can only do telehealth if they sell off their assets and go into business flogging the services themselves. It betrays no sign of embarking on a frenetic pursuit of a corporation’s marketing dream; nor that it has adopted the false dilemma that has echoed hypnotically around the corridors of Cornwall Council: that do-nothing is not an option, unless you want to miss out on the prize. Don’t miss out on the prize. Other befoolery put to the council chamber this week included the suggestion that the outsource is not ideological or political. And that battery-level councillors cannot understand the complex contractual matters that have been occupying the Cabinet’s superior minds. Or perhaps even that Cornwall is in crisis. Lavery himself wrote in the Guardian last week that that at 8 per cent growth, Cornwall’s economic success is second only to the City of London. Perhaps councillors will gather their wits by considering whether Cornwall needs BT as much as BT needs Cornwall, or whether BT needs Cornwall as much as Cornwall needs BT.